Sometimes a project comes along that's different the norm. That once you have designed it you think, yeah, this might be the one that really gets to my students. I’ve taught this project now twice for one week periods and in it, I saw amazing discourse, incredible levels of creativity, and most importantly, I saw smiles. "So who am I and I am qualified to sell you curriculum?" To give you a little insight in my background, I am currently in my tenth year teaching 7th and eighth grade social studies. I have been TPT seller for many years having received over 140 positive votes and selling over 700 curriculum items. "Enough about the seller, tell me about the actual curriculum item!" Last year was actually the first year I used the superhero project. I built it completely myself and all resources including supporting documents and graphic elements were made by me and only by me. In terms of the project provided, this is what I refer to as a plug and play assignment. I am giving you all the tools including a project description, rubric, multiple differentiated worksheets which correspond with the rubric and an additional extra credit assignment if you so choose to use it. This is also easily an assignment that can be done during class time or assigned via chunking through a long term home assignment. As you can see, this assignment allows you tremendous flexibility. This should also be realized by both grade and subject level as well. I could easily see this translated across grade levels going as low as fifth grade to as high as tenth or eleventh. (possibly with some modifications depending on the level of the class) There are many ELA references in this assignment and it could be related to the upcoming elections or just general history as a whole. Ultimately,this project is not meant to trap you within a specific topic, it instead can cover various topics and time periods. "What do my students say about it???" Each February I administer a mid year temperature check to find out what's going right in the class and where we could do better. 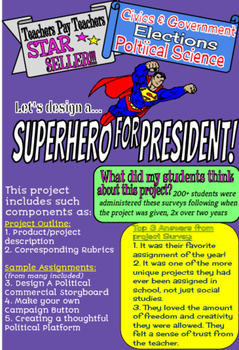 Two years and counting now, my students have said their favorite assignment is "Design Your Own Superhero for President." I was a little shocked at first as we do so many different dynamic assignments. But they said that they "loved working on their own" and it "gave them a chance to feel smart!" Students also liked the control and autonomy it gave them to be as specific as they wanted with their superhero. In closing I would just like to say that I really didn't plan to post this to TPT. I thought this would be something I would just keep to myself and use within my classroom. It was my students ultimate love of this assignment that convinced me. It is my hope that others out there can have the same amazing experience I had with project that I did! Good luck and let me know what kind of results you have!! !